Status: We have collected all the RSVPs for this show, designed the layout, worked out the run schedule and are about to apply to Greenberg's. Teardown: Sun Dec 12, 2010 4:00PM until however long it takes! Location: Oaks, PA - Greater Phila Expo Center. Greenbergs Train Shows ask for applications 3 months prior to a show. In that application your must commit to the size of the layout. 3 months prior to this show is September 11, 2010. See proposed track diagram below. Please provide feedback on layout. Dave Fortney has volunteered to transport the corners from Bill Ps house to the show and back. That is a total of 8 corner modules. He may need a little help in transporting 1 or 2 of them. Volunteers Needed! You can stop by Bill Ps any time to pick up. We have the ability to run TMCC, Legacy and Conventional but would need a TIU to run DCS. If folks want to run DCS, someone needs to bring a TIU. We will send in the application to Greenberg's presently. Trains! Bring at least two engines. 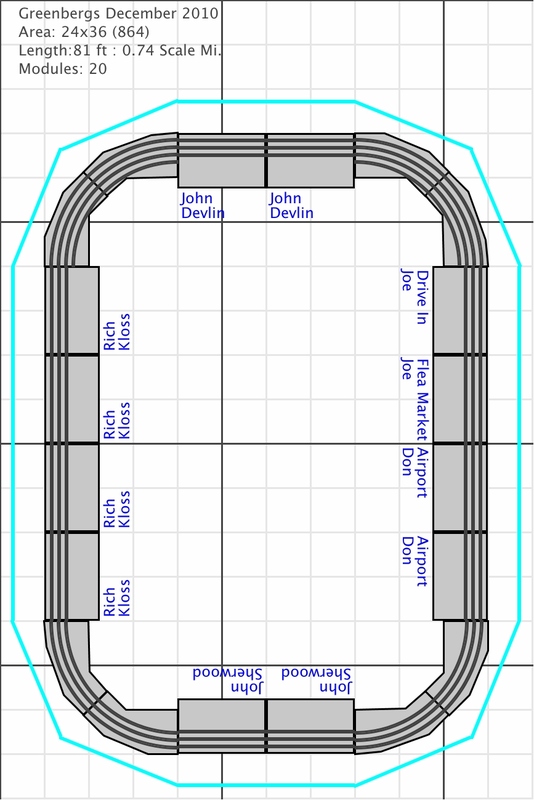 Here is the track plan.